The architectural firm of Stone and Smith designed this Classical Revival Carnegie Library which is faced with sandstone from nearby Sites Quarry. 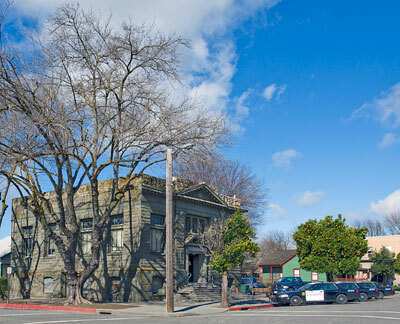 Completed in 1906 at a cost of $13,158, it was the third of thirteen Carnegie libraries built in the Sacramento Valley and the only one built in Colusa County. The building was a library from 1906 to 1964 when it became the Police Station for the City of Colusa. The Will Semple Green House is visible behind the police cars.